Why travel to Armenia? Because it’s a small, scrappy country that is a hotbed for history, lush as can be, and filled with some of the nicest people in the world. Don’t leave Armenia off of your list the next time you’re planning a vacation or backpacking adventure. Armenia is a tiny country, oft-forgotten by travelers due to it being tucked away behind Turkey and its more popular neighbor, Georgia. It’s an ancient and mystical land, and a country still unspoiled by the crowds of mass tourism. Its people are among the friendliest in the world, and it’s a serious hotbed for history. Some sites date back as early as 4,000 BCE. And whether you’re a lover of rolling hills, or prefer traipsing over snow-capped peaks, you’ll find what you’re looking for in the Armenian landscape. To seal the deal: it’s incredibly cheap, making it a perfect destination for budget travelers and backpackers. In three weeks of travel, I spent less than €500. Yeah, you read that right. Don’t leave Armenia off your bucket list. It can’t be hidden away forever, and the time to visit is now before it’s truly “discovered” by mass tourism. A breakfast spread of jam made from fruits from the trees just outside the door, bread made that morning, and cheese from a man in town. 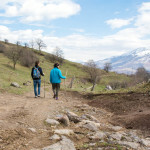 If you travel to Armenia, you’ll come back as a healthier person! We met a man in Yeghegnadzor, who invited us to his home for a homemade and homegrown snack. With a tone akin to a proud father sharing stories about his son, he told us of what it was like to live in a country where, in many instances, the furthest food travels is from the garden to the kitchen. It’s hard to not appreciate the irony–as the organic craze sweeps through the world, and bio-this and eco-that and GMO-free whoknowswhat products flood the shelves, Armenians are already living a lifestyle that people in other countries pay through the roof for. Everywhere we went, we were greeted with breakfast spreads of homemade jams, fruit harvested from the trees behind the house, thick butter and creams churned by hand, and wine made from grapes off of vines twined around the owner’s home. “I do not drink wine from the store,” one proud Armenian declared as he poured us glasses of homemade wine, “we only give store wine to people we do not like.” Fair enough! Tip: Still need a guide book for Armenia? We used and recommend the Lonely Planet for Armenia. The breathtaking monastery of Tatev, one of the most famous historical sites in Armenia. When you travel to Armenia, you travel to a country with a rich history and a dark past. Once a vast civilization, it is now a tiny land-locked country situated between Iran and Georiga, and trapped between Turkey and Azerbaijan, its enemies. Its people were slaughtered by the Ottomans in a genocide that is not yet recognized by many countries in the world, and its grand buildings were ravaged by a devastating earthquake in 1988. Despite its turbulent history, the Armenian people are fiercely proud of their country’s history, and for good reason. The Armenian civilization used to span all the way from Persia into Eastern Europe and was home to many significant historical firsts such as being the first country to make wine, and the first country to adopt Christianity. Getting a peek at the oldest winery in the world (almost 6000 years old) in the caves of Areni, Armenia. These days, you can explore the relics of Armenia’s rich past undisturbed–no need to dodge the selfie-sticks and tour guides armed with umbrellas. Take your time wandering through its monasteries and temples, and enjoy them in their silent splendor, while travel to Armenia is still off the tourist radar. Our enthusiastic host Lucy, in a town the south of Armenia. In some countries, pride for one’s nation stands in the way of friendliness towards foreigners. In Armenia, the exact opposite is true: because people are so proud of their heritage, they’re extremely happy when people visit. A great example of this occurred during our visit to Haghpat, a UNESCO monastery near Alaverdi. The groundskeeper was so happy to see a young, interested couple, and so proud of the monastery he’d been caring of for 10 years, that he personally showed us around, then let us into the bell tower, an area usually off-limits to visitors. The view from the bell tower of Haghpat monastery. We were greeted with smiles and friendly gestures everywhere we went. From free rides back to town after a day of hiking, without our asking, to fresh fruit and drinks in someone’s backyard, just because we happened to walk by. Travel to Armenia is full of these small surprises and acts of hospitality, which make a visit that much better. The Armenian people have suffered a great deal in recent times. In other places, similar experiences lead to anger and bitterness. In Armenia, it has led to a realization that the only way to combat the suffering is to support each other, and show kindness to guests, so others will be kind in return: a refreshing perspective in today’s polarized world. The metro in beautiful Yerevan, undoubtedly one of the safest capital cities in the world. It’s safe. Like, really safe. Because of this mindset, Armenians are incredibly respectful of both people and property. When you travel to Armenia, you’ll never have anyone trying to pick your pocket or walk off with your bag while you’re not looking. People leave their cars unlocked in parking lots and on roadsides, with the keys in the ignition. For women, on the rare occasion that a man makes a pass at you, simply saying “no” will cause him to back off and shake your hand instead. The only “scam” you’ll ever encounter is a taxi driver tacking on an extra dollar to his price. God forbid! Looking out over the epic spires of Goris, a city in southern Armenia. We hope that one day the world realizes just how much Armenia has to offer. The country is still poor, and unemployment runs rampant. Armenia could really use an increase in tourism. We have high hopes. The country has every ingredient in the recipe for a popular destination. We are sure that, with time, it will get the attention it deserves. Before that happens, make sure to pay it a visit. The country and the people will not disappoint. I really want to go now!!! You really should! We loved it and definitely want to go back someday. Thanks, we’re glad you liked it. Armenia welcomed us with open arms and embraced us from day one. It will always have a special place for us. That’s a very poor mistake to make–thank you for pointing it out! I’ve updated the post with the correct date. Thank you for writing this beautiful article about the land of my ancestors. <3 I can't wait to be there this summer! Much love and success to you! I don’t know where you are from, but in Los Angeles-which has the second largest Armenian population- I’ve met numerous people at college, who believe Armenian is a religion or it’s what they call people from Iran . Seeing you with your article just gave a second chance to my almost dying hope. A religion, really? That must be frustrating. We’re glad we could restore some of your hope. Armenia really does deserve more attention. Ah, the travel bucket list—just when you think you’re making progress, it starts to fill back up again! 🙂 We’re glad we could do your country a bit of justice. We absolutely loved Armenia, and are really looking forward to traveling there again soon. Winter wasn’t the right time to visit! What a beautiful post about Armenia! My background is Armenian and it makes me so happy to see the country through another’s eyes, especially when they see what I do! You fired up my nostalgia for the country… It’s been 8 years since I last visited and I want to go back now! We’re glad you liked it. We really think the country could use some more love! You should really go if you can. We hope to visit Amelia again soon too. Just back from Georgia (a trip to be thankful to for making me discover Lost with Purpose – long story, to be shared another time, if interested) and planning a trip to Armenia. Just wanted to thank you for making getting around in Tbilisi and its neighbouring towns (namely Mskheta and Gori, since we had only 3 days in Georgia) easy and affordable. Your nuanced travel info was manna from heaven considering we didn’t speak a word of Georgian prior (now I drop Gamarjoba and Nakhvamdis for no apparent reason). I see I have picked up your love of parentheses almost as much as your love for travel. Discovering your blog-sphere in more details this time. And relishing every word and the wisdom you impart to yearning travellers. Didi madloba. Hi Shabbir. Glad we could make your trip easier and more pleasant (and super happy someone finally acknowledges how awesome parentheses are). Cheers! I am perusing flights and was hoping to take my 4 year old daughter somewhere for her first International trip. Would Armenia be a good place to visit with a 4 year old? In terms of safety and weather (in the right season), we think Armenia is great for children. However, we’re not sure if there are many activities specifically geared to young children, that just isn’t our domain. And road travel isn’t very comfortable, so that’s something to take into consideration. Myself Sumesh & my wife Bindu , from india and resident in Muscat -Oman. We had our trip to Armenia in last September . What you wrote in your article about Armenia is absolutely right. Myself and my betterhalf are also fond of travel , visiting places , experiencing people culture cuisine etc… Armenia is a gem of jewels!!!.. As you said , a hidden treasure. We come across a lot of friendly people around Yeraven and through out the country. A handful of great memories to showcase for ever!!!.. Yes, Armenia is a spectacular country. I’m glad you and your wife had a good time there! Legit tears. Thank you for this beautiful piece. We have been through so much, not only genocide but cultural genocide. For over 3000 years we created our own unique history only to be stolen. We are planning to visit Armenia in July. Can u please tell me how the weather would be ? Looks so amazing. Right now we’re just waiting for a cheap flight deal over to pop up! Will go there in two weeks. Could you pls advise on language issues? Does anybody from you speak Russian? I guess not knowing russian language will be issue when talking to locals..
We’re currently in Armenia and loving it. You are so right on every point. It really is an amazing country with such kind people.